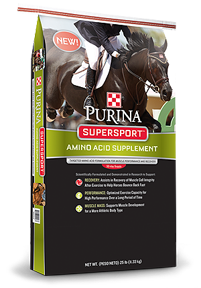 Keep your horses in top form with Purina SuperSport, amino acid supplement and SAVE $10 per bag, at Pasturas Los Alazanes, while supplies last! Top-dress supplement over regular feed ration. May be fed once daily or divided into multiple feedings. *Round up to nearest bodyweight category. Feeding up to twice the recommended daily amount may benefit horses in intense training. However, this double feeding rate should not be exceeded. When fed as recommended, SuperSportTM supplement will provide no more than 0.3 ppm selenium to the total diet. This entry was posted on Wednesday, April 18th, 2018 at 8:43 am	and is filed under Event, News & Updates, Specials. You can follow any responses to this entry through the RSS 2.0 feed. You can leave a response, or trackback from your own site.